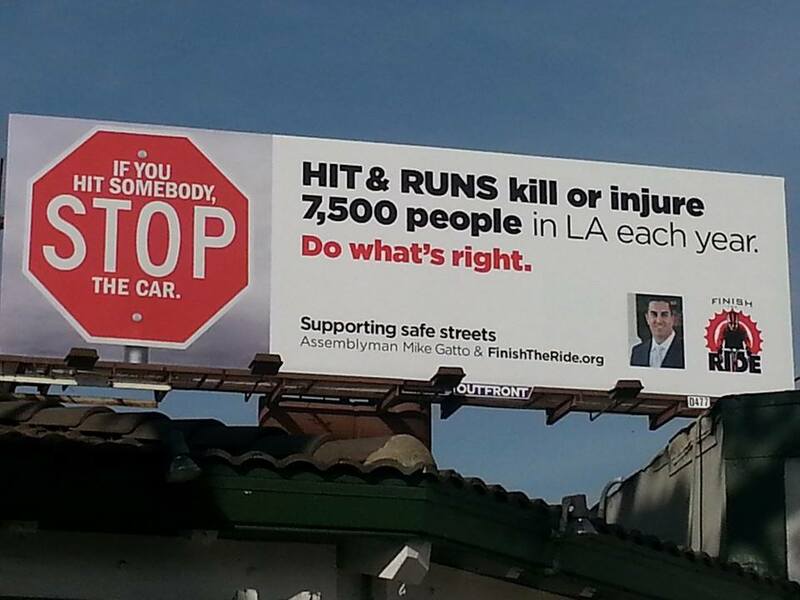 If you’re traveling through Pasadena, you may note a new “Public Service Announcement” billboard from Finish the Ride and Assemblyman Mike Gatto urging people to stop and give aide if they are involved in a traffic crash. It’s no secret that both Finish the Ride (FtR) and Gatto are champions of reforming hit and run laws and enforcement, but this marks their most visible effort (outside of FtR’s self-named bicycle ride and road run) to raise awareness through a media campaign. I talked with Damian Kevitt, the victim turned avenger who serves as the leader and inspiration for FtR about the billboards. While this one will be moving to a “nearby location” in the next couple of weeks, they are looking for sponsors to run a statewide P.S.A. campaign. They are already working with the LAPD that would run throughout Greater Los Angeles. Here’s a prize for Streetsblog readers, the first person to send us a picture of the billboard that they take on their own and tell us what street corner the billboard is at wins a Streetsblog t-shirt. Leave your submission in the comments section. https://www.flickr.com/photos/spidra/17396614138/ It’s on Colorado Blvd. near Rosemead Blvd.